2004.“Chiasmata” was recorded during Boddy’s concert at the planetarium of the National Space Centre, Leicester, UK on 1st November 2003. Boddy has, in the past, often used concert appearances as a testing ground for material that would then see a full studio re-working before release. Indeed this was the original intention with this concert but on listening to the tapes in the post-concert calm of his studio it became apparent that this material had really worked well in the concert environment. There was passion and delicacy in equal measure and a sonic construction to the semi-improvised set that would be next to impossible to recreate in the hard, cold glare of the studio spot-lights. The music on “Chaismata” spans over 10 tracks with a total running time of 68:46. The first 9 tracks form a continuous suite of music, the last track being the encore piece from the performance. 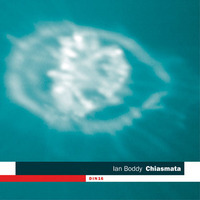 One of the main hopes that Boddy had when he formed the DiN label in 1999 was to provide a melting pot for several areas of electronic music to cohabit and intermix. Many have seen it as the perfect environment for the marriage of early Teutonic/space music styles with more modern forms of electronica. “Chiasmata” is a perfect example of this and shows just how comfortably Boddy has absorbed these influences to create a confident assemblage of sonic genres interlaced with his own virtuosic sound design. The music ranges from deep space ambience through chilled out analogue grooves by way of classical orchestrations and Berlin school sequencing to intimate solo piano improvisations. The main suite of music seamlessly blends all these elements into a continuous set that ebbs and flows with the assured touch that Boddy brings to bear on his concert appearances. A skill he has developed with over 80 concert appearances spanning 23 years of playing “electronic music”.